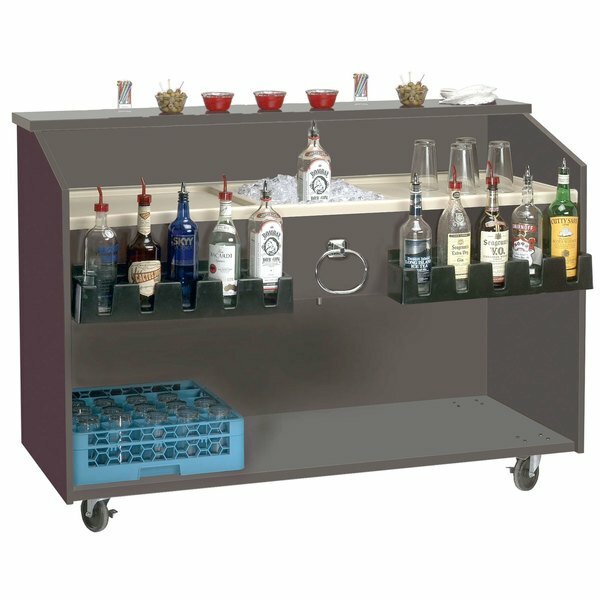 Advance Tabco M-B Portable Bar with ABS Molded Work Top - 61" x 24 1/2"
Designed for light-duty use by small hotels, catering operations, and more, this Advance Tabco M-B portable bar with ABS molded work top allows users to take their beverage service on-the-go with incredible ease. A deep drawn molded ice bin that measures 18" x 14" x 10" is fitted into the middle of the ABS countertop and includes a drain with shut-off valve. The unit's stylish black finish and 11" wide bar top provide a professional and polished look, making the entire unit perfect for any setting. A pair of speed rails can hold up to 10 bottles of liquor, while the single towel ring keeps your favorite bar towel within arm's reach. An open bottle shelf provides glass rack storage and can comfortably fit several tiers of racks. Thanks to four 4" swivel casters, and two with brakes, transportation from one destination to another is effortless. The Advance Tabco M-B portable bar provides everything you need to supply excellent drink service in any location.